Which of the following are the sides of ? 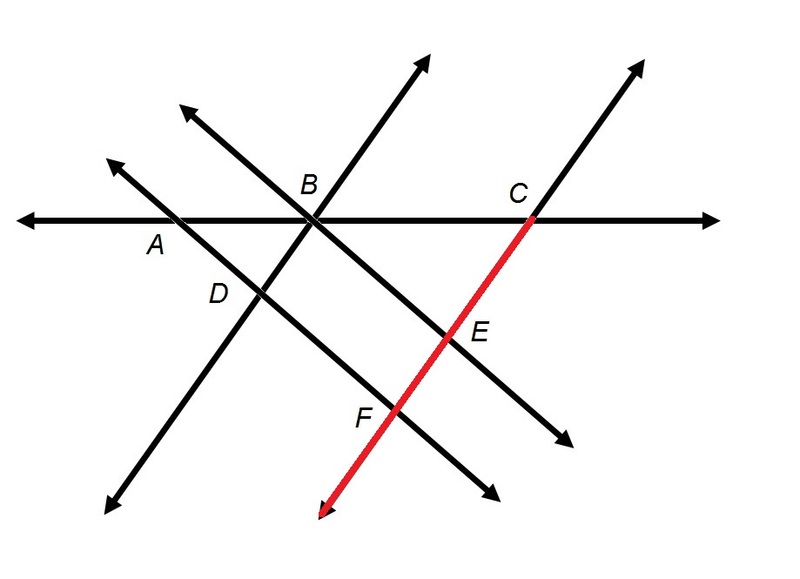 The sides of an angle are two rays, both of which begin at a common vertex. Since the middle letter of the name of this angle is , is the common endpoint; therefore, the name of each ray starts with . This makes and the correct choice. Note that and cannot be correct: these are line segments. Which of the following is not a side of ? The two sides of an angle are the two rays that compose it. Each of these rays begins at the vertex and proceeds out from there. In naming a ray, we always begin with the letter of the endpoint (where the ray starts) followed by another point on the ray in the direction it travels. Since the vertex of the angle is the endpoint of each ray and our vertex is , each of our rays must begin with . Only fails to do so. How does a ray differ from a line segment? A ray has two end points whereas a line segment only has one. A line segments connects to itself forming a shape, a ray does not. A line segment has two end points, a ray only has one. Ray has two end points. A line segment continues in both directions, a ray only continues in one direction. 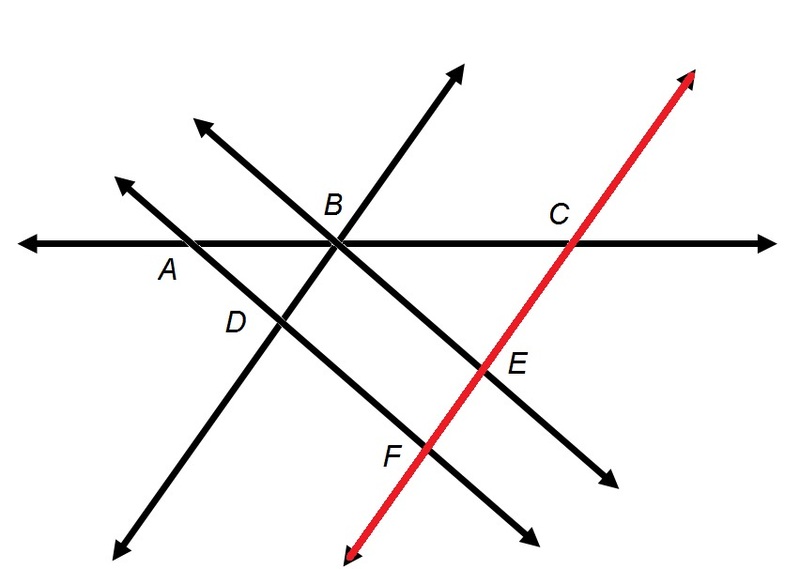 Line segment: part of a line that has two distinct end points. Ray: portion of a line with one end point, where the other end of the line continues to infinity. Refer to the above diagram. The plane containing the above figure can be called Plane . A plane can be named after any three points on the plane that are not on the same line. As seen below, points , , and are on the same line. Therefore, Plane is not a valid name for the plane. Refer to the above diagram. True or false: can also be called . A line segment has two letters in its name, each of which is an endpoint. is therefore the segment marked in red below. is not a valid name, since is not an endpoint of the segment. A segment is named with only two letters, each of which is an endpoint. is not a valid name. True or false: and refer to the same line segment. The two letters in the name of a line segment are its endpoints in either order. Therefore, is the segment with endpoints and ; consequently, it can also be called . True or false: and refer to the same ray. A ray is named with two letters, the first of which is an endpoint and the second of which is any other point the ray passes through. is a ray with endpoint , and is a ray with endpoint ; and are therefore not the same ray. The ray also passes through Point , so the ray can also be called . Voorhees College, Bachelor of Science, Biology, General.